...our everyday lives have been insane. I am finishing my last day of work, no more fifth graders, no more getting up early, and no more more being sick every week. I think I am really going to miss this americorps job, a lot. Mike is trying to graduate, he says he will... 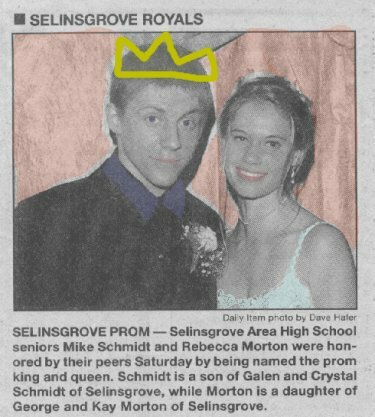 I think he has his doubts but there is no doubt that he is a well liked kid, he was the prom king for his senior prom (crazy, huh?. Eric has been working from 5 am till 10 pm six days a week to save up money before we hit the road and finally, Charles has been struck pretty hard with some type of spring fever. He will recover just 'how soon?' is the question. ...the seven inch on rosepetal turned into a cd ep. It has three new songs on it and four old songs that were released in like 1996 (yikes). We titled it 'Wound Up Down South' and i think it is our best stuff to date. the amazing layout was done by our friend chris sleboda. It should be available on JUNE 10th for $5 PPD from Rosepetal. Our first full length 'minus wings and halo' will be available at the same time for $7 PPD from Rosepetal also. Last but not least we are still doing a split seven inch with local superstars the Grey AM... this one should be a treat and contains songs not released anywhere else. It is on Da Capo al Fine (yes, the same label as the Jazz June split) and should be out in mid june, we hope. ...the tour is shaping up. The first five weeks are with Ethyl Meserve and the second part on the west coast is with the already infamous Grey AM What more can I say. Please keep checking our show listing for updates and even better come to a show our two we always need and appreciate the support. Good vegetarian food and comfortable sleeping accomodations are sure fire ways to win the hearts of mcj. We still plan on raising as much havoc as normal, just on less wafflehouse food.